The balance of Jerry Weist’s collection plus other original magazine art went under the hammer at Heritage Auction’s “Illustration Art Signature Auction” on June 27-28 in Beverly Hills. 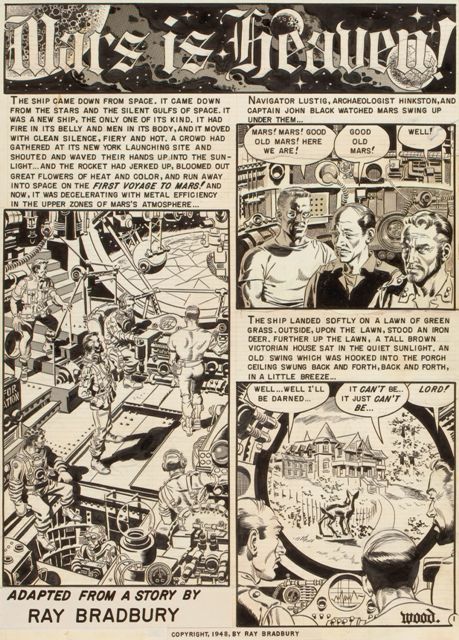 Wally Wood’s original black-and-white art for “Mars Is Heaven,” an 8-page Bradbury story published in Weird Science #18, fetched $54,687.50, the top price for a piece from the Weist collection. This was the second auction of Weist collectibles. Other high-ticket items were Michael Whelan’s “Descent,” The Martian Chronicles cover (1990) sold for $37,500.00. Al Feldstein’s black-and-white cover for Weird Fantasy #13 went for $22,500.00. Four issues of the Shuster and Siegel fanzine Science Fiction with the earliest appearance of Superman sold for $4,062.50. Harry Warner’s 1972 Hugo went for $2,000.00, part of a lot that included a printed bound working draft proof of All Our Yesterdays, a dust jacket mockup for Wealth of Fable, and copies of both books. Robert Bloch’s green and yellow horror painting sold for $1,000 and Ray Bradbury’s pink alien for $812.50. Lou Goldstone’s cover for a 1940s issue of the fanzine Voice of the Imagi-Nation attracted a bid of $212.50, and an interior pulp illustration by well-known fan Alva Rogers, $162.50. Three more artists with multiple works bringing stratospheric bids were Alex Schomburg, J. Allen St. John and Frank R. Paul. Alex Schomburg’s Rockets to Nowhere book cover sold for $15,000.00; Trouble on Titan book cover, $12,500.00; and Science Fiction Plus, March 1953 cover, $11,875.00. J. Allen St. John’s Swords of Mars preliminary book cover in color went for $15,000.00 and another version in charcoal on paper for $9,375.00. Several vintage Frank R. Paul works went for good prices: Wonder Stories, August 1930 cover, $14,375.00; Science Fiction Plus December 1953 digest cover, $10,000.00; Stories of the Stars: Aldebaran, Fantastic Adventures back cover, $7,500.00; Rockets and Men interior illustration, $4,687.50. Also of interest — Theodore Seuss Geisel’s editorial cartoon of Hitler brought in $15,000.00. Internet bidding has begun in Heritage Auctions’ Illustration Art Signature Auction which includes an array of items from the collection of the late Jerry Weist. This is HA’s second auction from his estate and will be the last substantial selection. Download the catalog here [large PDF file]. Final bidding takes place June 27 and 28 in Beverly Hills. A four-issue set of Joe Shuster and Jerry Siegel’s rare fanzine Science Fiction, The Advance Guard of Future Civilization is currently going for $2,000. Issue #3 contains “The Reign of the Superman,” with Shuster’s first drawing of Superman, five years before the character was unveiled in Action Comics #1. Sf, fantasy and horror artists represented in the auction include Charles Addams, John Berkey, Rick Berry, Hannes Bok, Chesley Bonestell, Howard V. Brown, Edd Chastain, Vincent DiFate, Leo & Diane Dillon, Emsh, Clay Ferguson, Virgil Finlay, Frank Kelly Freas, Robert Fuqua, Tom Kidd, Josh Kirby, Frank R. Paul, Richard M. Powers, Alex Schomburg, J. Allen St. John, Van Dongen, Wesso, Michael Whelan and Gahan Wilson. There are two noteworthy pieces from the Weist collection by people better known for their writing, a grotesque fantasy in green and yellow by Robert Bloch (1957) and a pink alien by Ray Bradbury (1958). There’s even some art with fannish connections, by Lou Goldstone (for Voice of Imagination) and Alva Rogers. Jerry Weist’s The Comic Art Price Guide: Illustrated Guide with Price Range Values, Third Edition is now available from Ivy Press of Dallas. The guide contains more than 500 pages of art reproductions, price range values and artist bios. It was one of Weist’s last projects before he passed away in January 2011. The landscape of genuinely reliable reference guides is an ugly, arid junkyard. Mostly lit by the dim bulbs of the amateur, the slovenly, the jumped-up fans stealing from each other’s inept, error-riddled trashbooks. Jerry Weist towers, like the Great Lighthouse of Alexandria, casting a knowledgeable, insightful beacon. He can be trusted because he be so savvy. This September Heritage Auctions will put up for sale Jerry Weist’s trove of sf and fantasy art, rare first editions, movie posters, fanzines, and comics collected over the course of a lifetime. The auction will be held at Heritage’s Beverly Hills offices on September 12, in conjunction with the company’s Rare Books auction. Works by some of the greatest artists in the field will be available — Frank Frazetta, J. Allen St. John, Frank R. Paul, Wally Wood, Virgil Finlay, Alex Schomburg, Chesley Bonestell, Richard Powers, and Frank Kelly Freas. Weist passed away in January with several projects still in the publishing pipeline. Heritage will publish the new edition of Weist’s Comic Art Price Guide this summer. HA’s full press release is online at Art Daily. When Jerry Weist e-mailed his client list in March about a new e-Bay auction he also shared the latest information about his cancer treatment, reports the Scoop. …Weist told his email client list that this will be his last eBay auction prior to entering a stem-cell transplant procedure later this Spring/Summer to fight cancer.